It speaks volumes that … its newsworthy that a Republican would meet with people who hold a different view. Presidential politics can put candidates in some pretty odd situations. Just ask Ted Cruz. 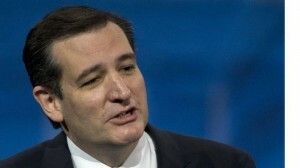 The Texas senator and 2016 Republican candidate was in New York this week. One of his stops was a reception Monday night at a grand apartment owned by Ian Reisner and Mati Weiderpass, two gay hotel tycoons. The purpose of the gathering was to discuss Cruz’s position on Israel, according to Cruz national campaign spokesman Rick Tyler. “It was all things Israel,” says Tyler. “They were in a discussion about something they all agreed about” — meaning their strong support of Israel. Tyler says that at one point in the conversation, the topic of gay marriage came up — an issue about which Cruz, who opposes gay marriage, and his hosts, who support it, definitely did not agree. According to a report by the New York Times’ Maggie Haberman, Cruz adopted a “different tone” that night than he has taken at other times when discussing marriage. Was it a flip-flop? Garden-variety political flexibility? Or perhaps, as Cruz’s supporters maintain, was it consistent with the senator’s oft-stated support of traditional marriage? Cruz will undoubtedly be asked about it sometime.